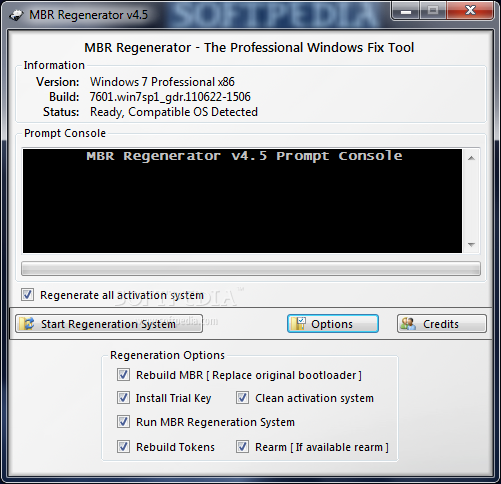 MBR Regenerator is an application designated to repair the operating system that contains corrupted files caused by malicious programs who were able to damage the Activation System and the important operating system files, restoring Windows as a Fresh Install without reinstall or removal of any personal data\files. Core file modifications such as shell32.dll, uxtheme.dll and others can cause your system to be unstable and slower. With the MBR Regeneration System, you are able to repair your operating system completely without lost files or configuration changes. Repair, recover, and restore all Activation Systems, by restoring the Windows Activation Technologies updates to their original state, installing the trial key, and rebuilding the boot code. “Regenerate all activation system” feature can help you regenerate the operating system by running a fix without any touches on the activation area if it is not selected. Your system will return to an untouched state and System 32, which contains important system files, will be back to normal – like it was when you installed Windows. These recovery features are powered by the WinSxS directory that stores an image of all essential operating system files for a later restore. MBR Regenerator gathers important instructions to restore these files properly. Boot with the winxp cd and select the recovery console.Type in "Fixmbr" press enter and "fixboot" press enter.Fixes most problems with xp boot. My system is using Windows 8.1 but I wonder if this will be compatible as the OS is not listed. Any help Please! Thank you very much Sir for this wonderful and excellent tool, though I wonder if this tool can also be apply to latest versions of Windows like Windows 8 to Windows 10? is there program for windows 10 too ?? I hope I don't screw up my stuff with all these wonderful app's! !Thank You once more! Dear Admin, The Link is Dead. Kindly add the updated software and Download Link. Thank you a Lot for Tech-Tools (ThumperDc). i will support you.